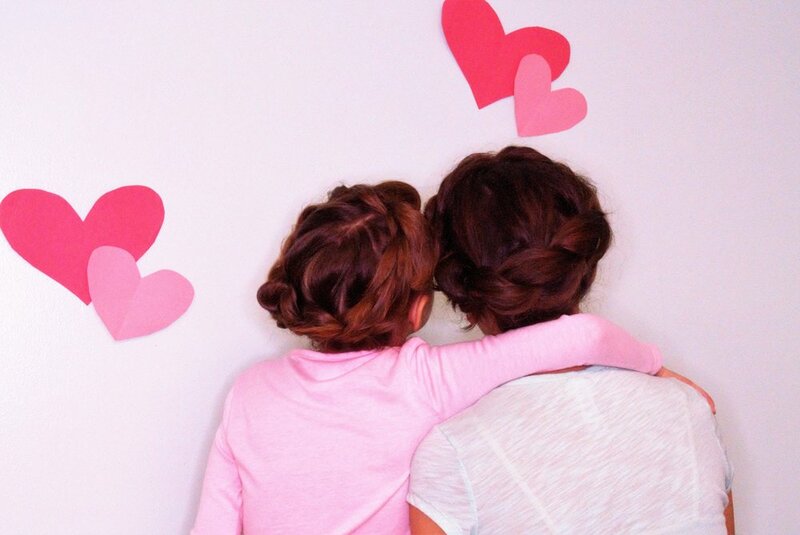 How to create matching hairstyles for sister or mother & daughters. I LOVE learning to create new styles and watching tutorials. Having 2 girls I mostly watch tutorials for young girl hairstyles. Creating something that is fun and young is my favorite but my girls are 6 years apart. So a style that looks good on my 6 year old doesn't always appeal to my 12 year old. I found 3 young girl hairstyles that I was able to tweak enough for my 12 year old and still have them matching. These styles are perfect for sisters, cousins, friends and even mother & daughters. I'm starting with my favorite! Who doesn't love to have a bow in their hair? On the left is Lorena where I pulled her hair half up and the hair that was pulled back was made into a bow. Isabella, on the right, has all her hair pulled up into a bun and the hair that was left out of the bun was made into a bow. LOVE, LOVE, LOVE! How cute is this?! This style was super simple. If you know how to do a 3 strand braid, you'll be able to create this style. Let's start with Isabella, on the right. I pulled her hair half up, braided the hair that was pulled back then twisted that braid around itself and pinned in place. Now for Lorena, on the left, I sectioned her hair into 3 equal sized sections and used hair ties to secure the sections. Then braided each section, twisted the braids around itself to create a braided Mohawk. I would wear either style. Which one is your favorite? My third and final matching style is a pull through braided crown. Now it is the most complicated style but totally worth it. For each girl I made equal sized sections around her hairline. Then starting with a section behind the ear, you split that into 2 sections. Bring those sections around the section in front and secure with a hair tie. Continue to do that adding hair from each section until all the sections are gone then hide the end of the braid and secure with bobby pins. This is such a cute style that lasted all day! My beautiful models, Isabella and Lorena rocking their pull through braided crown. So grateful for these two!! Did you see a style for you and your daughter, sister or friend to rock together? Don't think you can manage it yourself? Call me to set up an appointment, I'd be happy to do the style on you and walk you through the steps showing you first hand. Call (724)290-4634 to set up an appointment!